My neighbour is a beautiful woman with thick curly hair that always stands out. I with fine hair do get envious (sometimes) of her big fabulous hair. Last week we got talking, and I asked her what she puts on her hair. I knew she was using something natural. 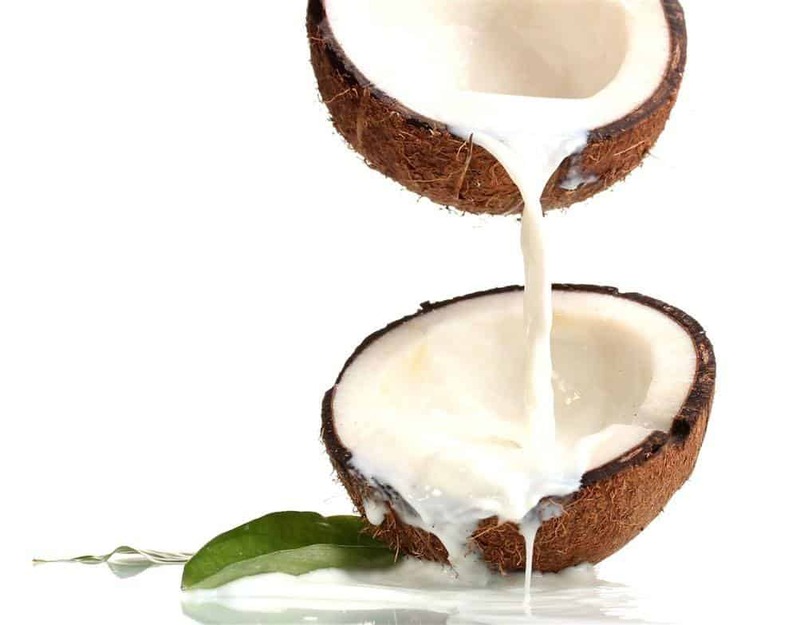 …and her hair secret is nothing fancy, but very common… Coconut Milk. Coconut milk she says keeps hair soft, shiny and well defined. It also helps with manageability and frizz. Coconut oil is pretty awesome for hair. But if your hair is dry and coarse then skip the oil and use coconut milk. This is because dry hair needs a combination of fatty acids plus moisture – which the oil lacks. This delicious creamy milk acts as a great conditioner and helps to moisturise every strand and condition from within. With just one use you will notice how soft, shiny, and silky your hair feels. Plus, your hair will be easy to comb, as coconut milk is a great detangler. You will have no more hair breakage. Nutritional Benefits: Coconut milk contains tons of good fats, proteins, vitamin C and minerals including manganese, copper, iron, magnesium, phosphorous and zinc – all of these nourish hair follicles and makes hair grow longer and healthier. You can also drink this super-nutritious milk for healthy skin, hair, bones, joints, and overall wellness. Simply dilute coconut milk with equal quantity of water and your delicious coconut drink is ready. Made with just two ingredients: coconut milk and olive oil, it’s super-easy and natural and will leave your hair feeling lush. Mix all the ingredients in a bowl. Your mask is ready to use. If you find the mixture too thick you can add some warm water to it. Start with dry or damp hair. Apply this mask to your hair and scalp, put on your shower cap or wrap your head in a muslin cloth or a towel. Let it soak in for 45 to 60 minutes for it to really moisturise your hair. Next, wash hair with one of the natural cleansers and dry naturally. And don’t be surprised if your hair is soft, shiny and bouncy. Just like you have sashayed out of the salon. You can try adding other oils like olive oil, avocado oil or coconut oil to this mask. You can make your own coconut milk using fresh coconut, or even dried coconut meat. Honey can make your hair light over time, so a good alternative is blackstrap molasses. You may skip conditioning after shampoo, see how your hair feels. Use this mask once a week or once a fortnight. Enjoy your gorgeously soft, nourished hair! Do you use coconut milk for hair? Does your hair like it? Please share in the comment box below! I was very excited to find your website. I have been suffering from hair loss on and off for a few years now. My doctor ruled out any mineral/vitamin deficiency with blood work. Currently my hair falls in chunks and am beginning to see my scalp. I am going to try out the hair mask with fenugreek and yogurt. Is it recommendable to do this treatment at lease 2 times a week. I am also trying the rice water rinse. Any other suggestion would be very much appreciated. Do the fenugreek and yogurt mask once a week. You can alternate it with egg and olive oil hair mask. Hello, since milk doesn’t really suit my hair type so can I use yogurt instead of milk? This is coconut milk, not dairy milk. I tried this but with mustard oil as olive oil doesnt suit me. Amazing results. Mixed only coconut milk and oil. It was runny but my hair kept absorbing the mixture and did not drio much. Coconut oil doesnt suit me. Makes my hair fall fall fall and ends drier. But this was different…..it was lighter but it worked better! Thank you for sharing this……i can finally soak in coconutty goodness! Smells heavenly too! Yeah coconut oil is horrible on my hair too. I may try the milk. I lost my hair very badly. I have less hair in my front portion. I want your suggestion minaz maam. Please help me. this is fantastic. i’m such a slacker when it comes to deep conditioning. i did this mask and it was super easy and my hair has been amazing all week. full and bouncy. I added rosewater to the mask too was that a mistake? And when I shampoo and condition my hair can I just use normal supermarket products? Hi Ayat, this is another good one. You can use a store bought shampoo. For conditioner, you can use a hair mask, or oils like almond, avocado, sesame, mustard, olive before head bath. After shower what you can do is apply a few drop of almond oil (or rosewater spray) to your towel tried hair. Hi Minaz, my hair is thick dark and coarse. Moreover, the biggest problem I have is my long baby hair which always makes my hair look shabby even with little changes like wind blowing lightly, I sneeze hard etc. My baby hair goes all the way from forehead till my ears but not beyond it, so neither I can join it in a ponytail or have it in front. I have these baby hairs of varying length and when I just put on a ponytail, it looks so awful and shabby even if i just combed my hair. Do you have any suggestions for a good and chemical free hair spray? Do you have any other suggestions to manage it? search for flax seed gel or aloe vera for hair, or rosewater spray. Thank you Minaz! I will definitely try the sprays you suggested and mask and will keep you posted. Have you tried this mask? It may settle down the frizz, because when hair is moisturised it stays calm. First, stop counting your hair every day. I don’t think you are losing too much hair. Massage once a week. And do a daily meditation and yoga. Your hair loss will reduce. Hi.Can I apply this hair mask on oiled hair? What is your opinion of using baking soda as shampoo? I tried it a few times, and it was alright. Some people find it drying in long run. Have you used castile soap? No i haven’t. I’ve heard good things about it. So i’m planing to do the egg shampoo and green tea and aloe rinse tomorrow. I’m worried that the green tea will dry out my hair too much.